Hadley Arnold of The Arid Lands Institute explains what she believes could be feasible long-term solutions to California’s drought. Would it be possible for Angelenos to capture water and feed it back into the water system just as we are starting to do with distributed energy and solar panels on our roofs? Yes, we can, according to Hadley and Peter Arnold, partners in life and work who met while studying architecture at SCI-Arc. They went on to found the Arid Lands Institute at Woodbury University, a research institution that investigates the relationship of pre-industrial communities to water in the arid West and applies those findings to 21st century technologies. How to do this? Through recycling, conserving, and strategically harvesting every drop that falls on the region. 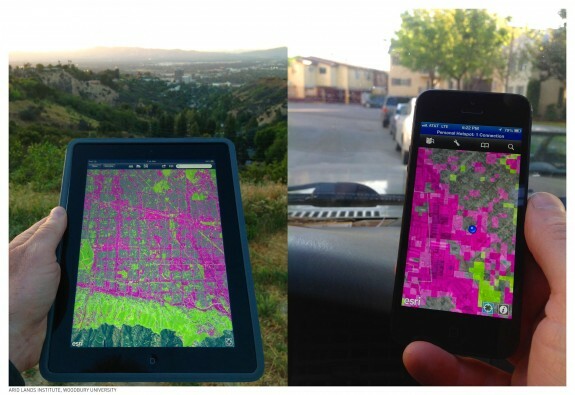 With the help of engineers, architects, water managers, planners and policymakers, they are creating a digital map of the L.A. region, that breaks up land into “three hydrologic urban zones”: for example, one color for areas for water capture where you could install permeable paving and allow rain to replenish groundwater supplies; another for other areas of contaminated land where water could be captured in external devices like rooftop cisterns. 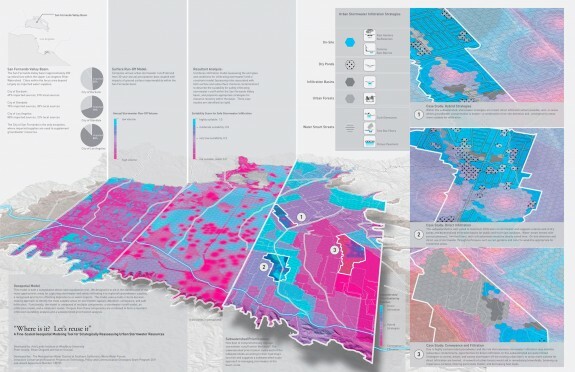 The project is called Divining LA: Drylands City Design for the Next 100 Years, they refer to the map as a “hydrologic zoning overlay” and it all connects to an App called Hazel (named after the traditional divining rod). It’s not available yet — Hadley and Peter are thinking longterm. But they are convinced necessity will breed a change of attitude to water in the Southland and that we will all acquire the “deep water intelligence” of our forefathers and mothers in the West. DnA talked with Hadley about “deep water intelligence,” simple ideas for cutting back in the short-term, such as getting rid of the lawn and installing a gray water system if possible; and, most importantly, the romantic origins of the couple’s passion for water smarts. Hazel takes soil, hydrology, contamination, land use, permeability, and precipitation data and makes it available for planners, designers, and property owners to know where to do the right thing—infiltrate here; don’t infiltrate there. DnA: Can you explain Divining LA? Hadley Arnold: It doesn’t rain much here, but when it does, we can’t afford to see that stormwater run off to the sea anymore. We need to grab it, and we need to infiltrate it (meaning, allow water to soak into the soil to percolate down to groundwater.) It turns out that blanket policies—grab all that water and infiltrate it anywhere and everywhere— are probably not in our best interests. There are good places to infiltrate stormwater and not so good places. That has to do with the behavior of soils, it has to do with land uses and it has to do with where there’s contamination already underground. Old sites that have cleaning fluids from the aerospace industry, areas where there are leaking gas tanks are not good places to be putting stormwater into the groundwater table. So we need access to all that information, telling us the good places — and the not so good places — to grab stormwater and infiltrate it into your water table. With this information you’d see pretty quickly that you could have a whole new way of zoning in the city. We call it the hydrologic zoning overlay– infiltrate here to capture and store there, treat and distribute here. Just like you might have high density residential zoning or commercial zoning, you’d have a set of hydrologic guidelines for your property and your neighbor’s property.Your neighborhood might be an infiltrator neighborhood and another neighborhood might be a capture and storage neighborhood (meaning the water would be caught on the surface, not enabled to soak through the soil to the groundwater). The tools that we’re developing at the Arid Lands Institute will give us the information we need to tell us how our homes, how our neighborhoods and businesses might be tweaked, retrofitted or developed in the future to do exactly what they need to do to get the water back into the ground, build local resources back up in the Los Angeles basin and get us off dependence on snow that’s not going to be there in the future. Hazel identifies three hydrologic urban zones across the LA basin and prioritizes them: infiltrate here! capture and store here! distribute here! Aridlands says Hazel is “unique for its data intensiveness and for its high resolution,” giving the citizens of LA decision-making information down to 900 square feet. DnA: And how long term is this project that you’re thinking about? HA: We hope to be able to test it with the design professions over the next couple of years. We have a fabulous set of partners — Arup engineers, Perkins+Will architects and the City of Los Angeles Bureau of Engineering — who are helping us develop the tool and test it. We hope to then work with communities in neighborhoods across the Los Angeles Basin on demonstration projects, and then we’d like to work with the City of Los Angeles and the American Institute of Architects to integrate this hydrologic zoning overlay into new zoning law if that’s possible. It could take two, three or five years until we start to see acceptance of this new way of thinking. Then it could take years before we’re actually starting to build in this way. But we have a broad set of partnerships, a tool that is putting this data into the hands of practitioners and it’s moving fairly quickly at this point. So we’re optimistic that this might be a new way of building in arid and semi-arid cities. DnA: Say I have a property in an area that’s deemed to have good soil. How exactly is that infiltrated back into the water table? HA: You’d want to get permeable surfaces. You would want to treat every surface as a form of catchment in order to get water into the water table as opposed to getting it into an existing storm drain. You’d want to work with the Bureau of Sanitation, Public Works and flood control, the Department of Water and Power–all of whom are doing really important stormwater work right now–on how to reverse existing stormwater systems and get water into the ground not out to sea. All of those conversations need to be coordinated, and I think there are really important dimensions of those conversations that haven’t been worked out yet. For example, once you get that water into the ground how do you manage it how does it get treated, how does it get extracted? Who has the rights to it? Those are complicated issues that have not yet been resolved, but I think that’s the direction that Los Angeles is moving in– how do we localize supply and how do we localize governance over that supply? DnA: So is this the hydrological equivalent of people putting solar on their roofs and then selling electricity back to the utilities? HA: That’s an excellent example. Instead of depending on the importation of a huge amount of energy from a utility elsewhere, we’re seeing the distribution of photovoltaic panels over many roofs that’s a distributed energy system. This is an equivalent distributed network of small scale water systems. And how does that go into a grid– if you will–of collectively managed water resources? DnA: And just to make this visually understandable, what this might mean is getting rid of one’s asphalt driveway and replacing it with absorbent materials. HA: Yes, exactly. You’re going to want to put it into depleted groundwater storage basins, aquifers or the water table. If that’s not an appropriate place to put it, because of soils or because of contaminants, the next best bet is cisterns, but that’s more expensive. In districts where sinking water into the ground is not an option or not advisable, grabbing water and holding onto it in the architecture of a building is an option. For example, the roof could serve as a surface to catch water and then hold on to it, capture it, and treat it somehow in the systems of the building itself — that is of great interest to us. Of course it is longer term and not necessarily readily available or affordable as a do-it-yourself project this weekend, but it could be five, ten or fifteen years down the line. DnA: You have used the phrase “deep water intelligence.” Is everything you’ve just explained to me what you mean by deep water intelligence? It’s about reclaiming it as a true design question at the level of urban design, at the level of system design, city design, spatial design, public space and architectural building systems — where every surface is potentially a surface that shapes the way water behaves and shapes not just our supply quantitatively, but also our daily experience and how we relate to water and how water relates to us. DnA: You are thinking on a very large and long-term level, but you have a home, and you live in L.A. What are the personal things that you do to conserve water? HA: Let’s see. Our home is tweaked to behave in a certain way. 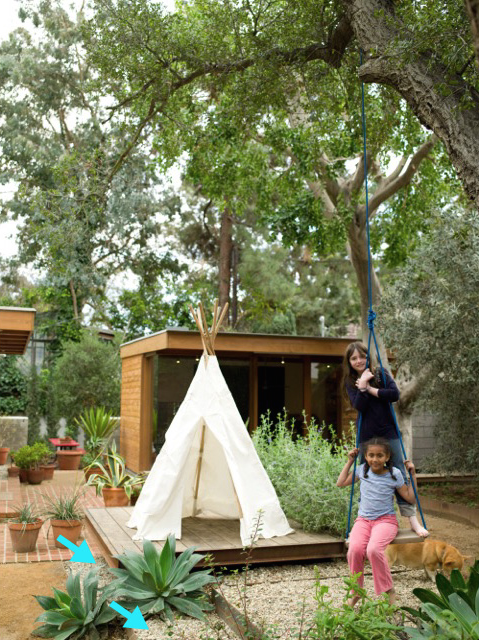 The lowest point on the property contains something called a dry well, which is basically a covered pit if you will. It sounds unsightly but it’s not at all. It’s a kind of subtle landscape move that’s designed for all water on the property to shed to it and sink back into the water table. We are in the process of installing a greywater system, which I’m really pleased about. We don’t irrigate. 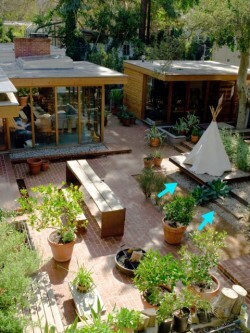 We don’t have anything really to irrigate except a few potted plants and a small kitchen garden. And I would say one of the things that we’re fairly mindful about in our household is that the way we eat relates to our water footprint. We try not to eat too much meat, because it’s an incredible water consumer. A vegetable-based diet is much less impactful on water supply. DnA: You run your institution Arid Lands with your husband Peter Arnold. How did this become a shared passion for you? HA: Well, I guess you could say first of all that we met when measuring and drawing water infrastructures at Hadrian’s Villa in Tivoli outside of Rome (while students at SCI-Arc). Very dry, very dusty, incredibly romantic. So somehow those twin things have been kind of intertwined for us since day one. And also Peter, as a Westerner, actually really introduced me to exploring the infrastructural landscapes of the West, and I guess you could say we spent a lot of time under the blanket behind his big camera with him introducing me to what it was that he was looking at. It’s very nerdy, but the romance of actually looking at these things has always been there for us. Sorry, it’s geek world, but it’s true. DnA: And clearly you haven’t lost interest in this topic yet? HA: Neither in water nor in Peter. This interview was lightly edited for length and clarity. Read more about their concept here.